My cousin`s 8 year old daughter Helen was diagnosed with Type B Lymphoblastic Leukemia when she was 4 years old. At an age where regular kids run to playgrounds, she had to visit hospitals for Chemo sessions. 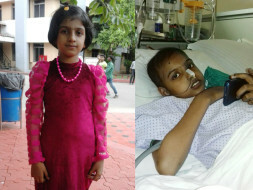 Her parents Manoj and Reshmi took every possible measure to get her treated. They sold their house and assets for her treatment. After 4 years, it has now relapsed and she is in a serious condition, fighting for her life everyday. 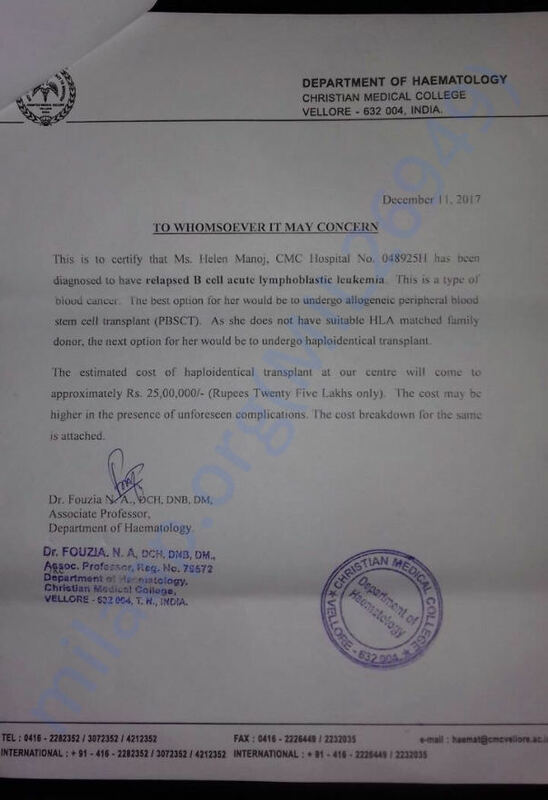 As she does not have a suitable HLA donor in her family, she is in desperate need of an immediate bone-marrow transplant. Her parents are already in debt and are knocking on every possible door for a possible donation to keep their daughter alive. 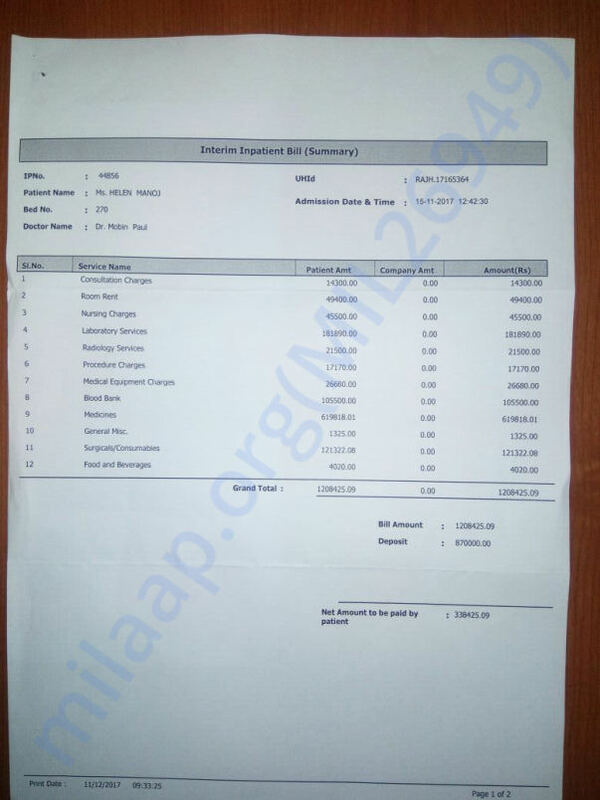 Any financial help will be much appreciated as it is towards giving Helen a life she deserves by fighting off this disease. With a heavy heart, I regret to inform you that Helen is no more. 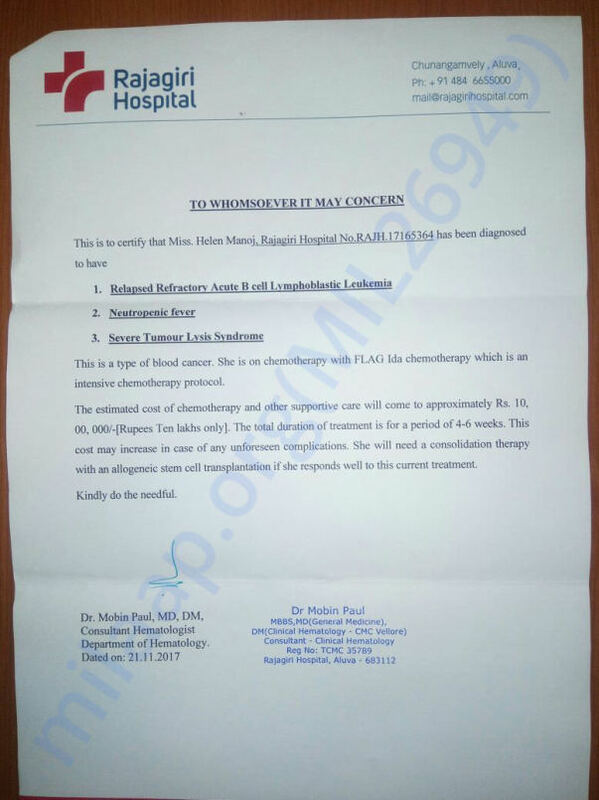 The doctors had conducted a few tests after the Bone Marrow Transplant, and there were traces of cancer cells. At this point there was nothing much that the doctors could do. She was taken back home and later, she passed away. We will update you soon regarding the utilization of funds. Please pray for her soul to rest in peace. Thank you all for the love and support. Thank you for all the wonderful support that you have shown towards Helen. 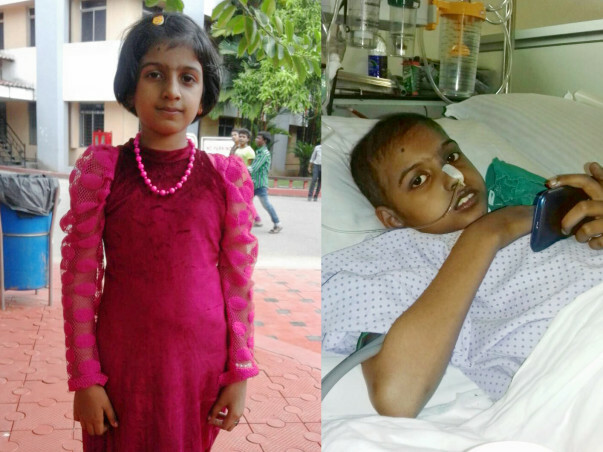 She is doing better now compared to earlier and was admitted to CMC Vellore on 25th December. She underwent a high dosage of chemotherapy and then had mild complications. Her facial muscles stopped responding and the doctors suggested that she needs to undergo another 2 sessions of chemotherapy before they proceed further with the bone marrow transplantation procedure. Out of the two chemotherapy sessions suggested, she is done with one of them last Monday and will be undergoing the second chemotherapy session in the upcoming week. Three weeks after that she will be undergoing the bone marrow transplant procedure. Her elder sister is going to be the donor and she is also undergoing certain procedure and tests to get ready before the procedure can begin. I would like to thank all of you for all the wonderful love and support that you have shown towards Helen. Would request you to share this campaign further with your friends and family to help us in raising funds further for her treatment. Will keep you posted. Helens Family is very grateful and thankful to everyone for the contributions. This means a lot to them. 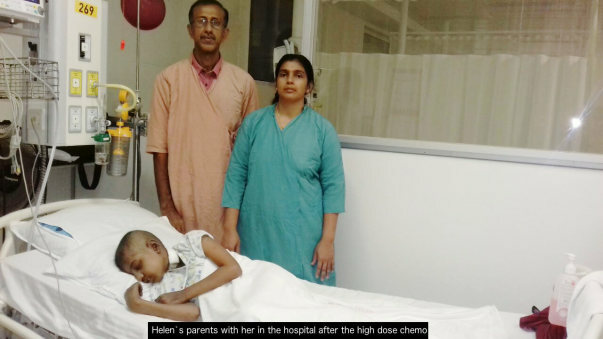 Helen has successfully completed her High dose Chemo at Rajagiri Hospital Ernakulam, Kerala, and the blast has reduced from 47% to 3%. She is now ready to be taken to Vellore for her Bone Marrow Transplant on 25th December. Please pray for Helen and her family to pass through this tough phase in their life. Do share this campaign further with your friends and family to help them in raising funds faster towards Helen's treatment. Please do pray for her health and speedy recovery. Will keep you posted. Thank you for all the support you have shown Helen. I hope Helen gets well soon.